'Good lord, would you look at that!' exclaimed Kathy. Jen joined Kathy at the window and looked out at the swirls of heavy falling snow. 'Traffic's gonna be a nightmare!' said Jen. 'And with the time change, it's almost dark out!' said Kathy, pulling on her coat. Outside, the two women headed off in different directions. 'See you tomorrow, Kathy,' called Jen. 'Well, have a nice walk, and you be careful back there!' called Kathy. Jen crossed on a sidewalk that weaved between the swaying evergreens and led to the large back parking lot. She inched cautiously along because the snow had made the pavement slippery. She emerged onto the driveway, and turned to look into the headlights of an oncoming car. She hurried to move out of the way, causing her to skid on the pavement and fall to her knees. Her cry of distress was lost in the flurries and howling wind. As the car glided past her, the driver turned to look, his eyebrows raising at the sight of Jen sprawled out on the pavement. 'Chivalry is dead!' Jen shouted at the retreating car. She got back to her feet and continued on her way. The long, wide parking lot was nearly empty now. The lights of a jeep wrangler came on in the distance; it pulled out and steered towards the exit. A half dozen cars belonging to the maintenance staff were left, oblong hulks buried under white. The mercury vapor lights that bordered the lot gave off an eerie glow that was all but obscured by the falling snow. Jen walked slowly, still wary of the slippery pavement. She looked neither to the right nor the left, and paid no attention to a battered old white van that was gradually being covered over. She did not see the tall figure who stepped out from beside the van and faced her. She got to her car, brushed snow away from the keyhole and unlocked the driver's door. She put her purse on the passenger's seat, and fished the window brush from the floor under the back seats. She sat behind the wheel and started the car. With the car idling and the exhaust sprouting a grey cloud, Jen methodically swept at the snow, uncovering the windows, the hood, and the headlights. She got back in the car, put it in gear, and reversed out of the parking space. She retrieved her purse and locked up the car. 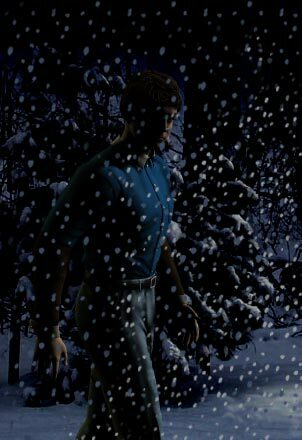 Engulfed by swirling snow, she began inching her way back towards the Hunt Building, a grey shadow in which a few glowing windows could still be seen. Then she noticed something to her right. 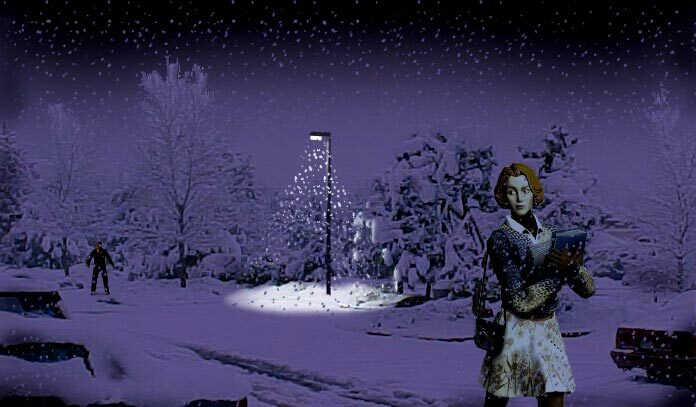 A lone figure in the snowfall, thirty yards from her, walking parallel to her course. He was moving slowly and carefully on the slippery pavement. They were both closing on the parking lot entrance, and would meet there it seemed. Jen struggled with competing impulses-- To greet the stranger and assure herself that he was harmless after all. Or flee to some place warm and safe and well-lighted, and hunker down defensively until the storm and the night were over. Jen veered to the left to avoid the tall stranger. Perhaps he hadn't even noticed her, and if she moved more slowly, he would proceed ahead of her into the Hunt Building. But then she saw two more figures ahead of her in the swirling miasma of flurries. They were mere silhouettes in the distance, but their movements were purposeful; she had the hunted animal's sense that they were taking up position to intercept her. The only escape lay ahead of her, if she could sprint through the open gap between the one on the right and the two on the left. She sighted on a lightpole that stood at the midpoint, and made a dash for it. But she only got two strides before her feet slipped out from under her and she pitched forward! The snow absorbed most of the impact, but she was rendered immobile. The precious moments it would take to get back to her feet would give her stalkers all the time they needed to tighten the noose around her. Indeed, the fall would give them a pretext to converge upon her. That's what they were doing now, moving towards her, carefully so as not to slip. It would only be a moment before they reached her. But then suddenly, long shadows sprouted from the feet of her antagonists, as the beams of a set of headlights swept across the scene. A car pulled into the lot, moving too fast, skidding and swerving towards Jen! She struggled to her feet and put her hand out in front of her, shattered by the certainty that in a moment she would be crushed under the wheels of the oncoming juggernaut. But the car slowed to a halt before her, and she put her outstretched hands down, palms down, onto the hood of the car, bringing it to a halt and allowing her to steady herself. Kathy opened the door of the car. 'Are you ok?' she asked. On the freeway, the car never went above 35 mph as they journeyed through the swirling precipitation. Kathy glanced over at Jen. Jen was silent, her head hanging dejectedly. 'This is a really beautiful neighborhood!' said Kathy as the car pulled up to the apartment building. 'You can let me off here,' said Jen. 'Sure. Anyway, if something bad happens to me, one thing's for certain-- I deserve it!' She smiled sadly at Kathy and shut the car door, then hurried up the sidewalk through the swirling snow. Kathy looked after her, puzzled and worried. Then she pulled away from the curb and headed for home. When Jen reached her floor, she stamped her boots off on the front mat and removed them at the door. She entered her apartment and took off her long winter coat. She looked out the living room window into the darkness and snow, then closed the curtains. She went into the bedroom and took off her work clothes. She took a shower, then changed into jeans and a t-shirt. She took a container of yogurt from the refrigerator, spooned some into a dish and carried it into the living room. She sat looking at her reflection in the dark TV screen and watched herself eating the yogurt. Then she went over and knelt down next to her stereo system, and thumbed through her CD collection. She lost interest in selecting a CD, and just sat on the floor looking down at the carpet. Her head turned to the side as if seeming something else. She sat that way for some time. The she turned and looked at the telephone. She got up and went over to the phone. She lifted the receiver and dialed a long-distance number. She could hear the phone ringing at the other end of the line, and then someone picked it up. Jen closed her eyes. 'I'm sorry... There's nothing I can do about it... I love you, Mommy... Goodbye.' She hung up the phone. Jen sat on the floor next to the phone, ragged sobs coming from her as she held her head in her hands and trembled. She stared at the closet. The door was partly opened. That was odd, she always left it closed. Nothing but darkness could be seen inside. She dashed over to the closet and pushed the door closed with both hands. In the next instant, there was something pushing back from the other side, and the closet door was being forced open again! The door was forced open, and Jen stumbled back. Panicked, she fled from the living room. 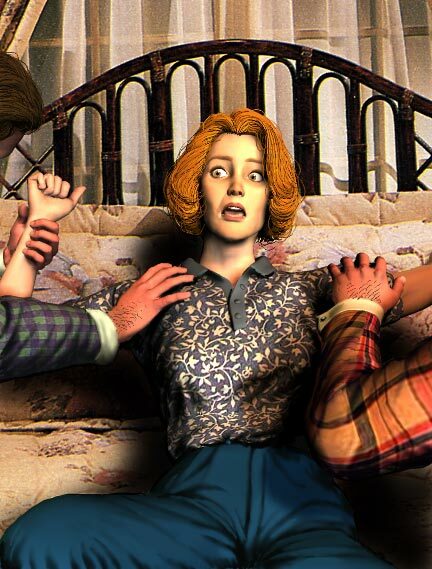 --and saw three dark figures standing around her bed! And then a man came at her from behind and got a hold of Jen. And the three figures emerged from the bedroom and helped him stifle her cries and carry her over to the bed. And while they were holding her down, someone was casually walking the distance from the living room to the bedroom. That someone was carrying a container of prescription sleeping tablets filched from Jen's own medicine cabinet. And over Jen's muffled screams, that person began speaking. 'I think you understand now, faithful one. I think you fully realize that the time of waiting is over, the list of excuses exhausted. It's time to give back what was given you. It's time to accept the warm embrace of your family.